Fighting against the Islamic State group in Libya intensified this weekend as U.S. Marines flying AH-1W Cobra attack helicopters flew over the city of Sirte to provide close-air support for friendly militias on the ground. Between Friday and Sunday, U.S. airstrikes destroyed 25 enemy fighting positions and two supply trucks, according to a statement from U.S. Africa Command. The strikes were conducted in part by Marine Corps Cobras flying from the Amphibious Assault Ship Wasp, which has been floating in the eastern Mediterranean Sea for the past several weeks, according to a defense official familiar with the operation. 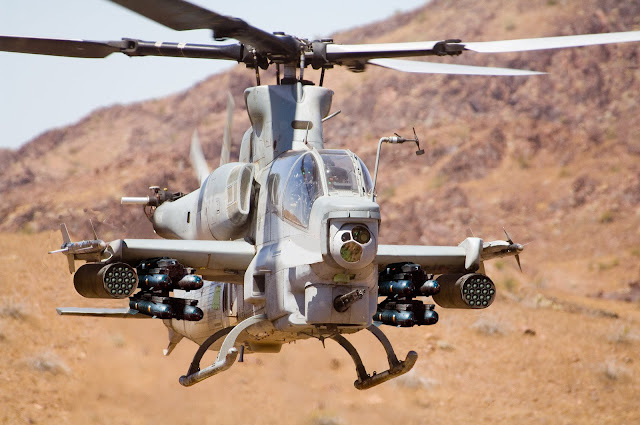 The strikes over the weekend marked the first time defense officials have disclosed using the AH-1W Cobras for strikes in Libya. The Cobras can loiter overhead to provide precise fire support for close-quarters urban warfare. Known as Operation Odyssey Lighting, the U.S. air campaign in Libya began with strikes in Sirte on Aug. 1 and have involved at least 74 attacks since then, AFRICOM officials say. Most were launched by unmanned aircraft and Marine Corps AV-8B Harriers that are currently deployed aboard the Wasp with the 22nd Marine Expeditionary Unit. AFRICOM said the strikes were conducted “at the request of, and in coordination with, the Libyan Government of National Accord,” which is a fledgling political body emerging from Libya’s two-year-old civil war. But that fragile government, known as the GNA, suffered a blow Monday when the Libyan parliament voted “no confidence” in the GNA, which is supported by both the United States and the United Nations. The Islamic State exploited the chaos in Libya to set up a base of operations in 2015 in the coastal city of Sirte. American officials several months ago estimated that ISIS had up to 6,000 fighters in Libya, but more recently U.S. officials’ say only several hundred remain in Sirte. Local reports suggest ISIS has lost control over most of the city during the past several weeks of fighting. The airstrikes mark the most significant U.S. military operation in Libya since the American-led air campaign in 2011 that ousted its leader, Muammar Gaddafi. U.S. military officials will not say whether there are U.S. troops on the ground in Libya. Small “contact teams” of special operations troops have gone in and out of Libya in recent months to gather intelligence and forge alliances with local militias, officials say.